A humpback whale bearing a tracking tag near its dorsal fin. The virtual Hogwarts Running Club funded Professor Ari Friedlaender's effort to track whales and observe effects of climate change on their behavior. Photo courtesy of Professor Ari Friedlaender. As temperatures rise along the Antarctic Peninsula, humpback whales are changing how they hunt for krill. To understand the changes, Professor Ari Friedlaender tracks their behavior with satellite tags. His observations promise insights about changing ecosystems and might help develop marine protected areas to maintain critical habitat for krill predators. 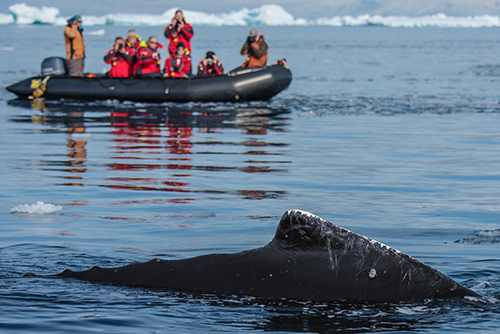 It isn’t cheap, and just getting to the Antarctic to find the whales can be an obstacle. So it made a big difference when the international, online Hogwarts Running Club sent Friedlaender $100,000. The virtual running club includes 65,000 members. They connect mostly through Facebook, holding annual House Cup competitions and benefit runs several times a year. Event fees benefit causes nominated by members. The event that earned Friedlaender his funding was the 2017 Platform 9¾K. The club favors “happy, feel-good” causes with tangible impacts, Biggs says. The idea came from club member Ana Chang. She had visited Antarctica with National Geographic Expeditions and says she was inspired to draw the attention of the club’s membership to the continent. Researching organizations that support science in the Antarctic, Chang found the Antarctic and Southern Ocean Coalition or ASOC. ASOC has been advocating for conservation policy in the region for decades. “I called them up and said, ‘I have this funny proposal,’ and they went for it,” Chang says. ASOC sent her a project proposal from Friedlaender, and Biggs and the club leadership approved. The run raised $130,360 for ASOC, and grew the club’s membership to include every continent. In addition to the whale tracking, the funds supported research on Weddell Seals and Adelie Penguins. The 2017 Platform 9¾K money enabled Friedlaender to purchase satellite tags and provided for logistic support, data analysis, and manuscript writing. It also lead to a partnership with the One Ocean Expeditions tour company—helping overcome the expensive obstacle of getting to the Antarctic. “They really put their money where their mouth is in terms of investing in things that are important to the people in the organization,” he says. Friedlaender hopes his research will lead to effective conservation policy for the region.